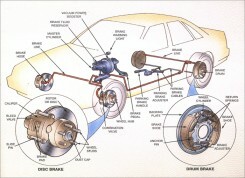 On this page we’re going to be looking at… brakes! Everything in a car is important, but brakes have one of the biggest roles to play. They are in charge of making sure the car slows down and actually stops! Every car has a brake pedal in front of the driver’s seat. When the driver pushes this brake pedal, it sends a message down to special pads that cling to each wheel telling them to squeeze the hub of the wheel. This in turn makes it hard for the wheels to move as quickly and slows the car down. It’s really easy to understand if you think about your bike. When you squeeze the brake handle, you can see clamps squeeze your back wheel, making it harder to move. This is exactly the same as on a car! Now with such an important job, it is necessary to check brakes regularly to en sure they are working properly, especially important when the weather is wet or icy. For example, after driving through a big puddle, the driver should always tap the brakes lightly after the wheels emerge from the water. This helps take moisture off the brake pads. Otherwise the brakes may be slippery and not very effective. Brake lights are just as important too, as these tell the people behind you that you’re braking – useful if you don’t want them bumping into the back of you! So it’s useful to check brake lights regularly to make sure they’re clean and working. Since brake lights are at the back of the car, this can be pretty hard – just try seeing what’s on the back of your head! The best way to check the lights is to position a car near a wall or garage door so that when the brake pedal is pressed, you can see the brake lights’ reflection behind you. Nothing though beats a mechanic, which is why cars go to a local garage for a proper check over – just like when you visit the dentist! 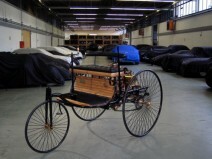 One of the first cars was invented in 1769 – over 200 hundred years ago! However, they probably wouldn’t sell many today – it’s top speed was just 2.5 miles per hour!